Lately P and I are having a great deal of fun with “Rainbow” crafting as a way to get behind the St. Patrick’s Day spirit! 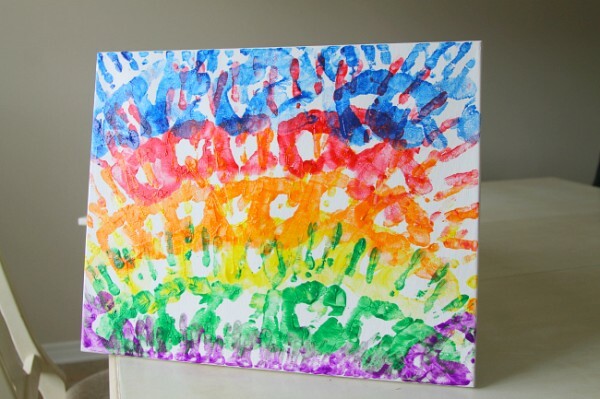 Although Charlotte was old enough to cut her hands out to create a paper hand print rainbow project, I wanted to do something more toddler friendly with P.
So off to the craft store! I happened to walk by a buy 2 deal with the Canvas’, so we grabbed that. They were $8 for 2 at Hobby Lobby! Then we came out and broke out the paints. 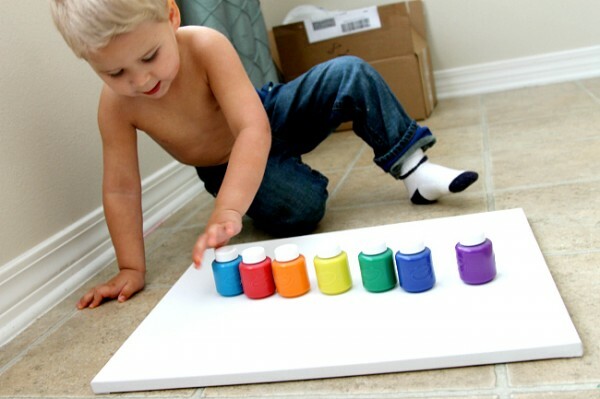 Even if you don’t have a canvas, you can do this on a poster board, foam board or plain old construction paper. I do find, however, that having the canvas makes a really nice keepsake to hang on the wall or to give as a gift to a grandparent. Line up all your rainbow paints and colors! 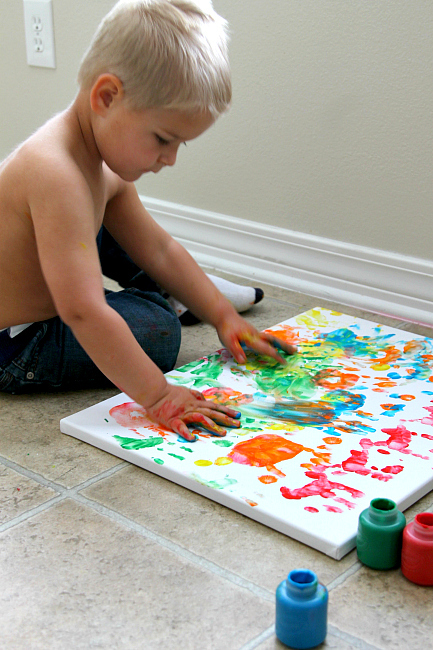 Starting one color at a time, paint your toddlers hand and have them put a hand print on the canvas. 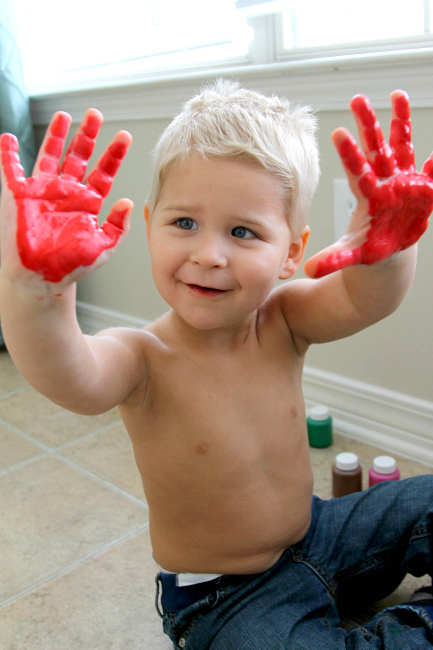 Before every hand print we talked about the color and after we wiped his hand and did a new color. He eventually took it over and did his own thing. 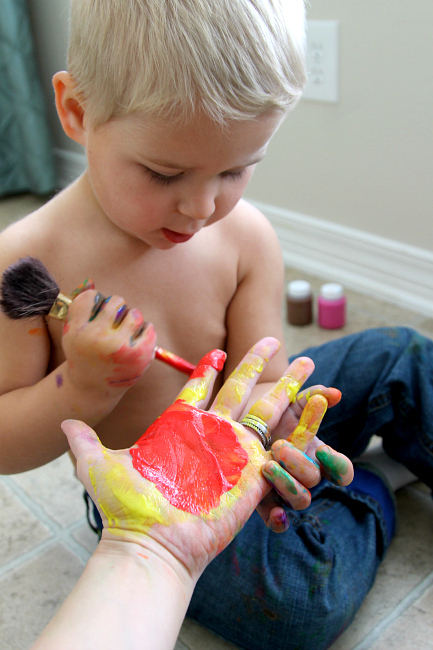 Now I let him paint MY Hands so I could make one! Mommy and Little P’s work! Trisha, you are so brave. Seriously, so brave! That is so precious! What an artist! This is adorable. I love how interested he looks. What a fun craft! Seriously he is so dang cute! He looks like he was having so much fun making this. That’s so sweet. It kinda looks like a heart shape in the middle of your palm.